On this page you will find a variety of rolled fondant and buttercream recipes for decorating a cake, particularly a wedding cake, which are from an old cake decorating booklet by Miriam Loos. Sift powdered sugar into a large bowl; set aside. In a 1 quart saucepan, sprinkle gelatin over water; let stand for 1 minute. Stir over very low heat until gelatin is dissolved. Add corn syrup, shortening and glycerin. Stir over very low heat until shortening is melted (do not boil). Remove from heat. Stir in extract. Pour over powdered sugar in bowl. Stir with a wooden spoon coated with non stick spray. With sprayed hands, knead in bowl until smooth and pliable. Add additional powdered sugar as needed if fondant is sticky. Spray counter top and rolling pin with nonstick cooking spray; dust with powdered sugar. Roll fondant into a 16 inch circle about 1/4 inch thick, rotating frequently to prevent sticking. If fondant seems too soft to handle, let stand for 20 to 30 minutes before lifting onto cake. See Miriam's Layered Wedding Cake for cake preparation and application of icing. The recipes below are Miriam's recipes also. In a large bowl, combine condensed milk, gelatin, walnuts and coconut until uniform. Cover and chill for 30 minutes. Shape mixture into strawberries. Roll in decorating sugar; place on waxed paper. Let stand for 1 hour or until a crust forms on the outside. Store in an airtight container in the refrigerator. 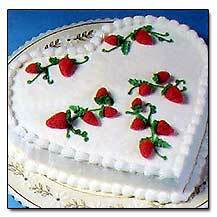 Use to decorate frosted cakes or serve as confections. Divide into portions needed. Use as is for crumb-frosting and final frosting. Add additional powdered sugar for a stiffer consistency. Use stiff frosting for writing and leaves. Tint portions with food color as required. Leftover buttercream can be kept covered in the refrigerator for several weeks. Note: For a pure white frosting, do not use vanilla extract. Colorless artificial vanilla can be purchased at specialty stores if desired. Other colorless extracts and liquid flavors are almond, coconut, banana, lemon, and mint. In a 2 quart saucepan, mix sugar and flour. Add milk and stir until blended. Stirring over medium heat, bring to a full boil. Gradually stir about one-third of the hot mixture into the egg yolks, then stir back into the hot mixture in saucepan. Cook and stir over low heat 2 minutes longer. Remove from heat. Stir in vanilla. Transfer mixture to a bowl and place a piece of waxed paper or plastic wrap directly on surface. Refrigerate at least 1 1/2 hours or until thoroughly chilled. Makes 3 cups or enough for two 10 inch ring cakes. In a 3-quart saucepan, combine water and corn syrup. Stir in powdered sugar until well blended. Over very low heat, stir with a wire whisk until barely lukewarm and sugar is dissolved (do not beat or bubbles will form) Remove from heat. Stir in vanilla and food color. If any small lumps are visible, pour the icing through a sieve. Use immediately while warm and thin. If too thick, add warm water 1 teaspoon at a time. If additional icing is needed, prepare a second batch separately. Stir in 1 1/2 ounces unsweetened chocolate, melted and cooled, with the vanilla.